How can corporate navigate their employees to smoothly sail and manage their financial wellness ecosystem? An insightful discussion on ‘Financial Wellness’ was chaired by Puja Kapoor (Head HR) - OLX Group, joined by other prominent industry experts like V Krishnan (Executive Director- Corporate HR) - Dabur India, Nitin Sethi (Head Talent Management – APAC) The Coca Cola Company and Akshay Mehrotra (Co-Founder and CEO) – EarlySalary at the Total Rewards & Wellness Conclave last week. The Talk Show began by assessing and emphasizing the need to support today’s workforce to smoothly navigate through the troubled waters of financial wellness. And the responsibility needs to be equally shared by their employers in every phase. Though the term financial wellness has exploded just over the past couple of years, however, this has been an intrinsic part of every employee life cycle since earlier times. Highlighting the need for employees to have a ‘manageable’ level of financial stress in today‘s world, it’s time that employers start to build on a concrete plan when it comes to creating an effective financial wellness ecosystem. Puja sets the context rightfully by explaining these three elements of Financial Wellness. 1. Financial Health - This refers to the objective measure relating to employees financial resources and the ability to meet their ongoing financial obligation in life and planning for their retirement. 2. Financial Wellbeing - It is a subjective measure involving an employee’s attitude and confidence about their financial situation. Financial wellbeing is all about their ability to manage it over a short and long period of time. 3. Financial Literacy - This refers to providing completely unbiased financial education to all employees that will equip them with the skills to manage their finances more effectively. However, employers find it quite challenging when it comes to handling wellness covering a diverse group that’s infused with baby boomers to millennials having distinct needs and perspectives. V. Krishnan from Dabur refers to the need of ‘Financial mass customization’ given the demographic and geographical spread; and the roles that exist in Dabur. It is also particularly encouraging to see how Dabur has adopted an open mind when it comes to helping their employees manage their financial priorities. They are fully in sync with building basic awareness at all levels through their internal resources and external bankers for meeting their diverse workforce need. Further, Akshay very rightfully focused the attention towards the dramatic changes in spending behavior that’s evident in employees’ life. The concept of credit as an instrument has undergone many iterations too. Hence, companies need to look at differentiation strategies while building financial wellness programs for their employees. Nitin built on further emphasizing the need for segmentation to address the issue of spreading financial wellness across a diverse workforce. Wellness, in general, is a responsibility for every employer and that’s what is followed in his current organization too. It is worrying to see when employers lose their ability to hold back good performers due to issues related to financial well being. He does not see financial wellness as an isolated pillar and recommends it to be made a part of the talent strategy as a whole. Nitin also accentuates the need for the right set of competencies when it comes to creating a financial wellness program. And if need be, employers must rope in specialist firms from outside, seek their help and get them in to make a better program by partnering with the internal HR and Finance team of the organization. The good news is that organizations have begun their journey for creating space on financial wellness for their workforce. However, there’s a need for some of them to take concrete steps to help their employees build financial planning by handling the stress intelligently. To sum up, organizations need to trigger the button of designing an effective financial wellness program with powerful financial investment decision on their people. A better financial wellness employee benefit programs may tend to offer access to unbiased behavior-changing resources, whether that’s financial workshops, webcasts, one-on-one coaching, technology-based platforms or fetching external experts to help employees move toward that state of well being. Simplify the practices while keeping customizing, segmentation and differentiation strategies in mind. 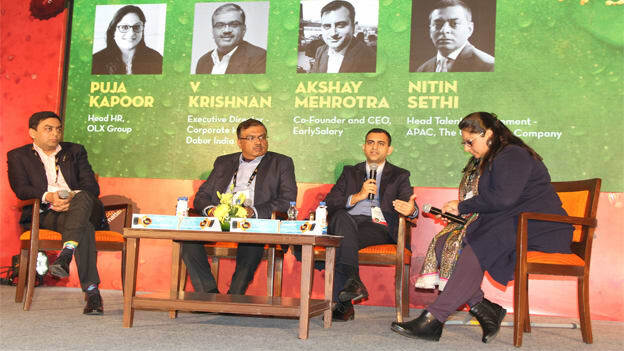 (This article is based on the talk show ‘New paradigms of financial wellness’ at the Total Rewards & Wellness Conclave’19 on 16th February 2019).